"Hello! Come play! sang the bird, and the bunny did. Soon they were friends." Some friendships remain strong over long distances and despite life changes. Carin Berger brings one such friendship to life in her new picture book, Forever Friends. 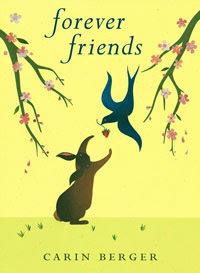 One spectacular spring day, amidst the blossoming trees, a blue bird and brown bunny meet for the first time. They become instant companions, playing together all spring and summer long. When fall arrives, the bird must fly south. The two friends miss each other over the long winter months but the time spent apart helps them understand exactly what it means to be "forever friends." It's never easy to leave a friend or loved-one behind, no matter if it's just for one day or over an extended period of time. Children especially can experience difficulties with separation, and Forever Friends helps reassure them that true friendships can weather many winters and indeed last a lifetime. The simple, short text pairs perfectly with Berger's intricate cut paper collage artwork. This book is a wonderful spring companion to Berger's previously published fall-themed book about friendship, The Little Yellow Leaf. The detailed collage illustrations are so exquisite -- Berger uses ephemera like old catalogues, books and receipts to craft her illustrations. Every time I read one of her books I notice something new (for instance, if you look really closely at Forever Friends, you'll notice a scrap of J.Crew & Vera Wang). I also simply adore Berger's trees, especially the ones composed of tiny bits of text, all carefully glued together to form bark. The differently striped legs of the bird made me smile, and I'm still wondering how Berger managed to place all those fine hopping/flying dotted action lines on the pages. Even though this is a children's book, I would also not hesitate to buy a copy for my adult friends and let them know how much I cherish their friendship. According to my daughter, "Her collage is so cool." Yes, it is...I couldn't agree more. 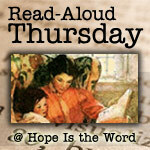 We attempted our own collage projects for this week's stART (story + art) crafts. The kids both made patchwork bunnies using bits of paper from magazines. At first my daughter cut out her own scraps, but quickly grew tired and would only complete the project after I cut the rest of the paper for her. My little guy only glued on a few pieces of paper before declaring his patchwork bunny finished. 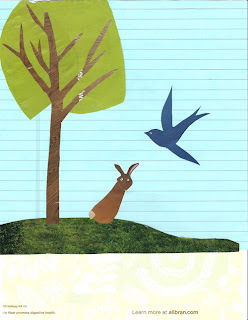 While the kids were busy gluing, I decided to try my hand at creating a Berger inspired bunny and bird image using cutout pieces from a magazine and a bit of blue lined paper. Cutting and gluing little tiny pieces of paper requires A LOT of patience and time. I must say after this little project I have gained a greater appreciation for Berger's illustrations! This book looks beautiful and your collage turned out great! I would frame that! Aw... that book looks wonderful! We live in a Navy town so my girls' friends move in and then move out just as quickly. This sounds like a great book to introduce them to. That sounds like a wonderful book! You always seem to have the best book suggestions. I love the way magazine scrap projects look. Great collages, and what an intersting book. I hope our library has it - we have friends we've left behind, too. Those are fun collages. What a neat book too! I love your own collage! Isn't it great that having kids creates a space for us adults to get creative again. I love this craft. It turned out very cute. I'm glad to discover your blog too. 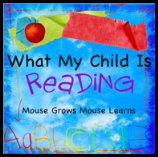 It's nice to have book reviews from a fellow mom! Now I HAVE to get this book. It looks wonderful! I love your artwork too. That's a great idea to give it to your adult friends. My college roomies and I have stayed close friends for 10 years and recently most of them moved to different states. This would be a sweet thinking of you book!Thanks or sharing your review.